Upwork is a massive search engine - just like good ol' Google. Difference is, Google sorts TRILLIONS of pages to find and return the information you’re looking for, using a specific set of signals, also known as "ranking factors". Upwork is a little different. Clients aren't looking for information, they're looking for freelancers. So, instead of dealing with pages, Upwork sorts freelancer profiles. The goal of this post is to look at what ranking factors might be at play on Upwork, and which ones we (as freelancers) can leverage for more profile visibility. Disclaimer: Upwork doesn’t publicly share how their search algorithm works, and while some ﻿of﻿ these factors do have a known influence, this post is based on my own research and understanding of how Upwork ranks profiles. Before we dive into the meat of the post, let's talk about the 4 areas of Upwork real estate. These are the places your profile can potentially appear if all the right signals -- or ranking factors -- are correctly in place. The most obvious area is the standard search results that clients are presented with when manually searching for freelancers. 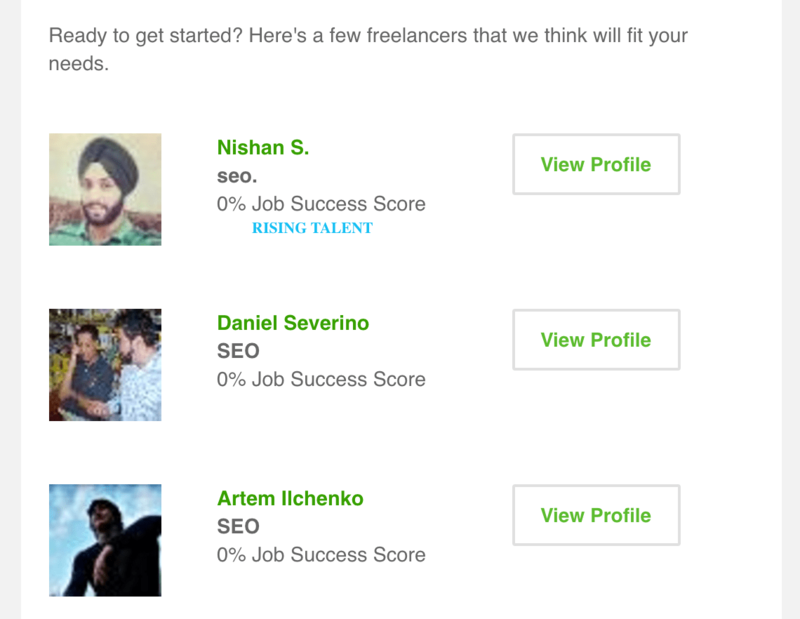 The 'Suggested Freelancers' page is where clients are taken immediately after submitting a job listing. In this case, since the client has just defined certain requirements and preferences, Upwork has a lot more information to feed the algorithm. And finally, the notification email is sent to clients soon after they post a new job listing. The email is more of a confirmation that the job listing is live, but it also takes the opportunity to suggest freelancers that may be a good fit. When I started looking at the potential ranking factors Upwork could be using in their algorithm, the list I came up with was HUGE. Does Upwork display metrics for it? Would it improve the quality of search results if used? Would it be technically viable to use? And doing that brought my original list of 50+ potential ranking factors to 29 very probable signals that Upwork pays attention to. Profile completeness relates to how much of your profile has been filled out. Make sure you've filled in all relevant sections of your profile to reach 100% profile completeness. 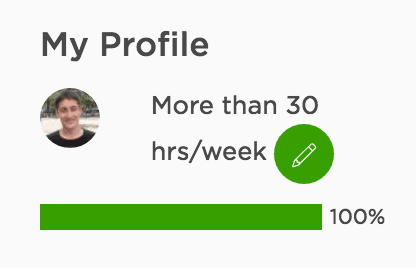 You can learn exactly how Upwork calculates profile completion, right here. Availability refers to your weekly availability in terms of taking on new, additional work. 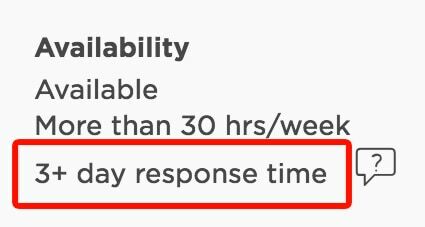 Upwork will recommend you to clients based on your availability, and their preference of availability (which they're asked about when creating a job listing). There's no right or wrong way to set your availability, but keeping it updated is the best way to ensure you're not contacted by clients with different expectations. Your status relates to your overall performance as a freelancer. It's visible by a little badge that shows by your name on Upwork. There are only 2 possible badges that can be awarded to high-performers, which are 'Rising Talent' and 'Top-rated'. Unfortunately, being awarded a status on Upwork is something that generally happens in it's own time as you build up your history. Just keep working hard, and trust me, it will happen! You can learn about the specific requirements of becoming a top-rated freelancer, right here. Your 12-month earnings refers to all the money you've earned in the past year -- including all contracts from all clients. You can see this under the 'My Stats' page right at the top. Again, this is something that will naturally build up over time, but it helps to aim for contracts with a higher earning potential and repeat work opportunity. When a contract ends, clients are asked whether or not they would recommend you as a freelancer. You can see what percentage of your clients would recommend you from the 'My Stats' page. To keep this score high, I recommend that you work with your clients to make sure they are completely satisfied before ending the contract. This is why I always recommend offering unlimited revisions on your work. It's always worth that extra time input if it saves you from a crappy score. You can see this under the 'My Stats' page. It's referred to as "Long Term Clients". The best way to continue working with your clients is to prove your worth. That means delivering on your promise, meeting deadlines, doing high-quality work, and, most importantly, actively looking for ways you can help them further. By doing background checks on clients before applying, you can also reasonably estimate the chances of repeat work based on things like 'Jobs Posted' and 'Total Spent'. Your Upwork account can be put on hold at any time if you're caught violating their terms of service. On the 'My Stats' page, you can also see how many account holds you've had, if any. It doesn't take a genius to know that account holds are NOT good for your rankings, so in this case, it pays to be a stickler for the rules. Reply rate is how quickly you respond to job invitations, if at all (to clarify, this doesn't include messages from clients). This is shown under the 'My Stats' page, next to "Responsiveness". It also shows publicly on your profile. To keep on top of this, I recommend having t﻿﻿he Upw﻿﻿ork app installed on your smartphone and responding to invite notifications within 24 hours. Application frequency is how often you submit proposals, calculated over a 90-day period. To maintain your rankings, it's a good idea to apply for jobs on a regular basis (even if I don't follow my own advice lol). Application views refers to how often your applications (or proposals) are viewed in relation to other freelancers in your category. You can see your performance under the 'My Stats' page. Submitting a proposal doesn't guarantee that it will be seen, but in order to increase the chances of a client clicking your proposal, it's important to apply for jobs that align with your profile. Interview rate refers to how often you're interviewed in relation to other freelancers in your category. The relevance and quality of your proposals will directly influence how often you reach the interview stage. If you want my best tips and tricks for creating proposals that get results, click this box. Hire rate refers to how often you're hired in relation to other freelancers in your category. Improving your hire rate is just a case of using your connects on opportunities that are properly aligned with your business. No prizes for this one. This is how often your profile is viewed (or discovered). 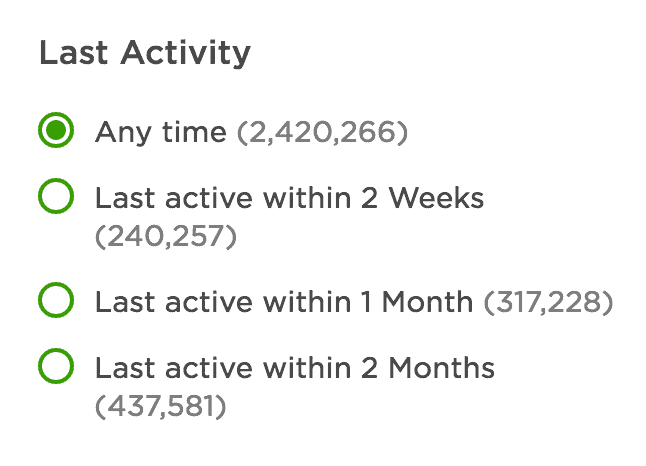 Upwork gives you some very basic analytics to see how you're doing in comparison to previous weeks. Now, you might argue that this metric is actually the result of your ability to rank, as opposed to being a contributing factor. To some degree, that definitely holds true. However, I still believe that Upwork takes profile views into consideration because it ties in with your click-through rate (explained below). Appearing in search is only half the battle, you still need to get clients to CLICK through to your profile. In the SEO world, this is called your click through-rate (CTR). There isn't a visible metric for this - but as I said - I believe it ties in closely with profile views. To improve your CTR, it basically comes down to having a well optimised and attention grabbing "preview box", as shown below. Your title and profile photo are the most important elements when it comes to improving CTR. The most obvious ranking signal for most platforms (including Upwork) is feedback / reviews. Stellar feedback is the backbone of your freelance business, which is why client satisfaction should be your top priority. Also, when the work is complete, it doesn't hurt to actually ask the client "to leave positive feedback" - and explain how important that is for you and your business. It's often better to refund a client if a contract ends on bad terms. Refunded clients are unable to leave feedback. Keywords are the specific words you use title and overview sections of your profile. Think carefully about the types of words used in your overview and particularly your title. Are they the most common keywords your clients would use to find you? While the most commonly used keywords should go in your title, you can ALSO sprinkle those lesser used keywords in your profile overview. Your job success score represents your overall reputation (and the quality you provide to clients) on Upwork. Once you've built up some history, you'll be assigned a job success score which displays on your profile and alongside your proposals. 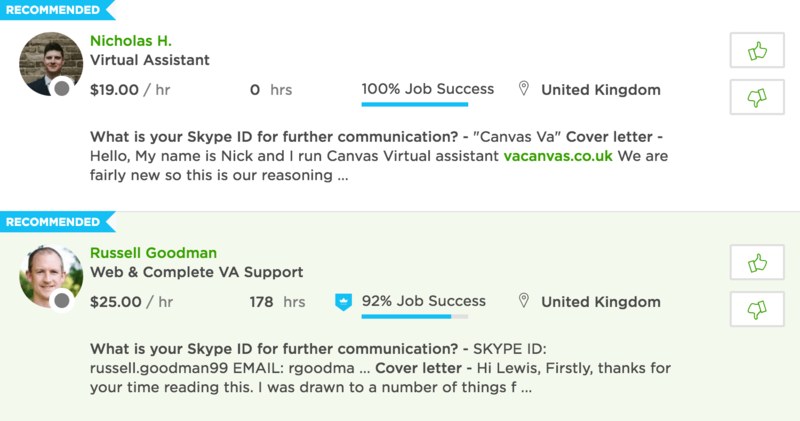 Upwork doesn't give too much away about how the job success score algorithm works, but it essentially measures positive contract outcomes against negative outcomes. Upwork recommends keeping your score above 90%, and you can read more on how to do that, righ﻿﻿t her﻿﻿e. 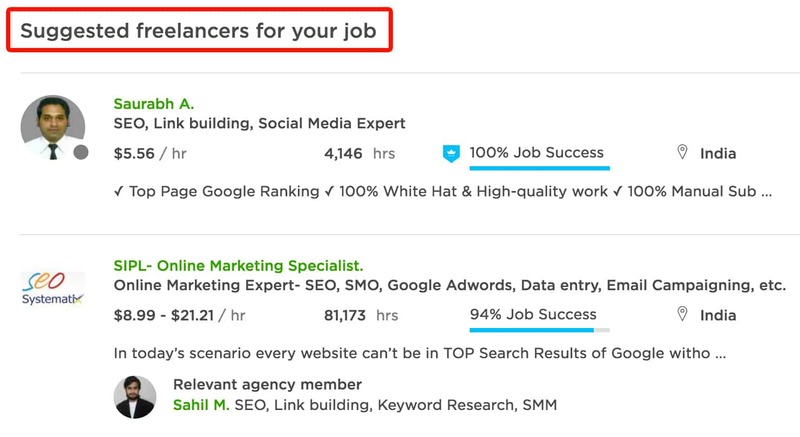 Your skills (or tags) represent the service or services that you offer on Upwork. They can be seen (and edited) below your title on your profile page. Your categories affect your rankings because clients can filter profiles by category. And they also add required skills to their job listings which influence which freelancers are shown to them after posting. 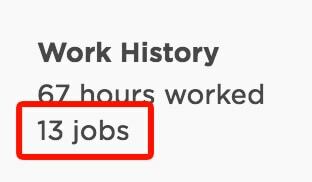 Upwork allows you to add up to 10 skill tags, and it doesn't hurt to max these out as long as the tags remain relevant. If you're having trouble using up all 10 slots, try using synonyms. For example, 'Email marketing' and 'Newsletter writing' could be considered the same thing. Categories are like mini-marketplaces within the Upwork platform, and they help filter job listings and profiles. To boost your profile visibility, I recommend adding the most relevant categories in relation to the services you offer. Skill tests are free online tests you can take on the Upwork platform. When you complete a test, it's added to your profile along with your score (which you get the option to hide if it's poor). I recommend taking at least 2-3 tests that most correspond with your skills and the services you offer. You can retake tests every 30 days, so don't be afraid to give it a shot if you're unsure. Your hourly rate represents your standard rate for hourly contracts. It's publicly visible on your profile and can also be changed directly from your profile page (by clicking on it). But even during the job creation process, clients are asked to choose an experience level (which correlates heavily with hourly rate). This dictates which freelancers are shown to clients immediately after posting a job. Account activity refers to how frequently you take specific actions on your account. Clients can filter out freelancers based on recent activity. Most clients who use this filter will select "Last active within 2 Weeks". Because of that, it's a good idea to not allow your account to exceed a 2 week inactivity period. Activity is counted as logging time, submitting milestone and sending proposals. 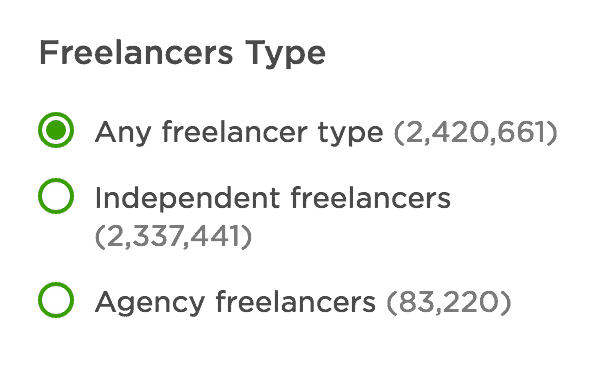 The two freelancer types on Upwork are independent and agency. 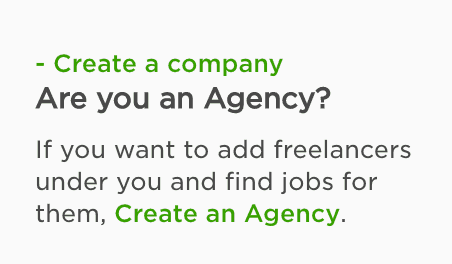 You can hire freelancers under your account and become and agency through your profile settings. Clients can also filter search results by freelancer type (based on their preference). Whether or not you come under 'Individual' or 'Agency' will depend on your business model and is something that clients will have their own preference for. Your location represents where you are (or where you live) in the world. You'll set up your location on account creation, but you can also change it under your profile settings. Your location (as well as local time) displays on your profile for everyone to see. Obviously, your location is your location so there's little room for optimisation. Be careful about trying to manipulate this because Upwork does track your IP. I've heard cases of freelancers being penalised for entering a false location. Your English level is self-assigned when you create your Upwork account. As you might expect, clients can filter freelancers by English level on the search results page. And they can also set a preferred English level when creating a job listing. Your English ability is not only a significant ranking factor, but it's also a big consideration for many clients on Upwork. 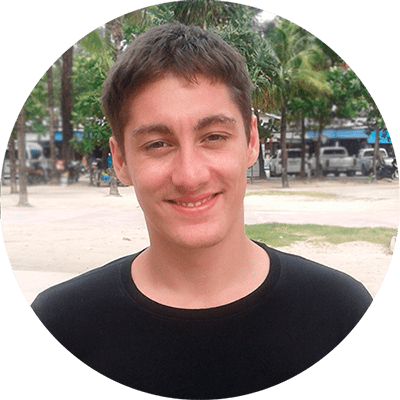 If you're not fluent in English, I would highly recommend making it a personal goal if you want to get the most out of Upwork. Your experience level represents your own opinion of how experienced you are in your field. 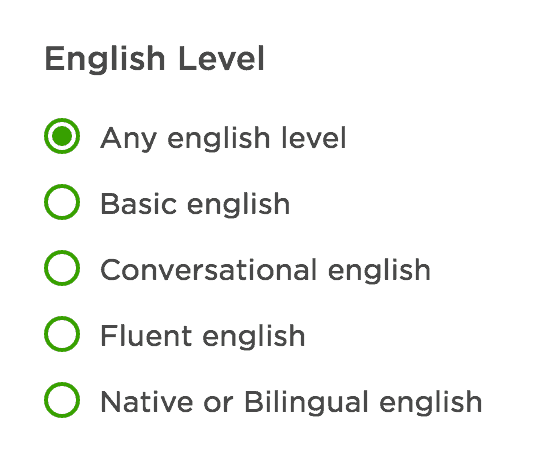 When you first setup your Upwork account, you're asked to select your experience level (you can change this in your profile settings). This is important for profile visibility because clients choose a preferred experience level for each job they post. The best way to optimise this is to choose an experience level that corresponds with your rates. 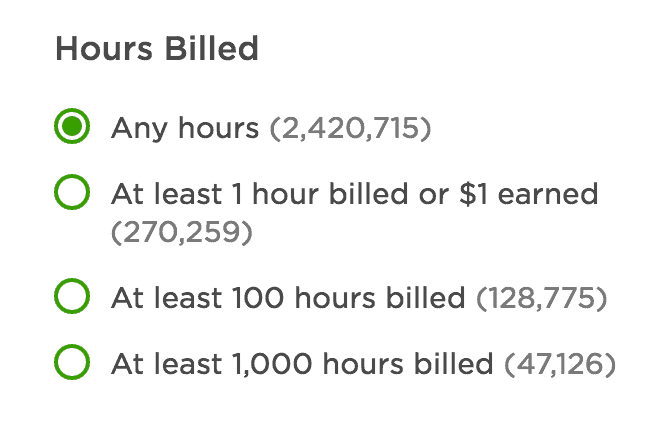 Hours billed is how many hours you've successfully logged on Upwork. The number of hours you've accumulated displays on your profile. Clients can use the search filters to exclude freelancers with a low number of hours billed. And they can also set a preferred number of hours when creating a job listing (which will dictate which freelancers are shown to them). The best way to accumulate hours on your account is to bill clients hourly if possible. Many clients are open to changing from fixed-rate to hourly if you ask -- so don't be deterred from applying for fixed-rate jobs if your goal is to rack up some hours. Jobs completed refers to the total amount of jobs (or projects) completed. 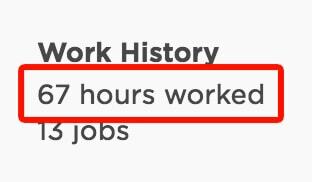 This is publicly visible under 'Work History' on your profile. Your job count will grow organically as you progress on Upwork, so for the most part, you shouldn't worry too much about this ranking signal as it'll take care of itself. With fixed-rate contracts, some clients will keep adding milestones instead of creating a separate contract. You may want to ask your client to start a new contract in this case, otherwise you could complete multiple projects under one contract, and it will only be counted as a single job. Finally, we have profile visibility, which refers to whether or not your profile is visible on the platform. You can toggle profile visibility under 'Profile Settings'. Obviously, having this set to public will give you the most exposure. Getting your profile to the top of Upwork's search engine doesn't have to be a struggle. It's just a case of understanding how it works, and then feeding the algorithm what it really wants. 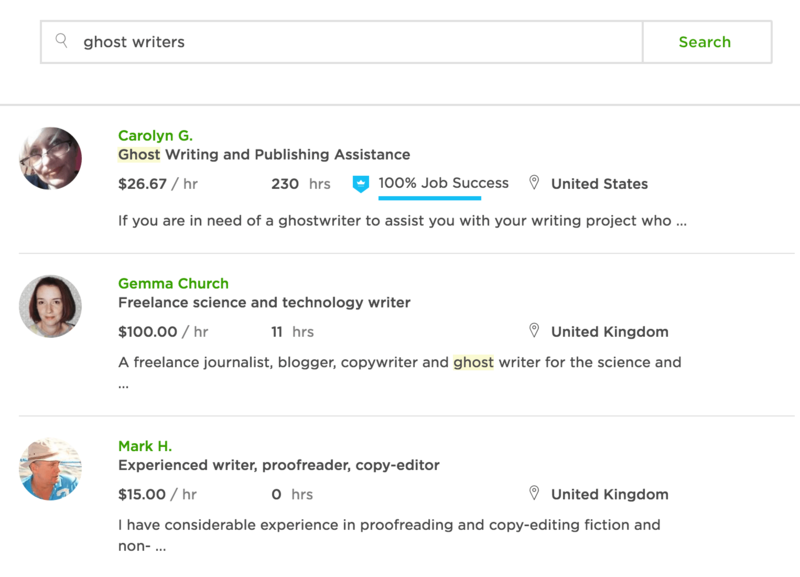 And if anything is crystal clear from all this research, it's that Upwork's algorithm is fine-tuned to pick out freelancers who do one thing. Consistently provide a quality service. If you can focus on doing that at all times, you'll find that profile will naturally start to gain traction on Upwork, and that everything else will fall right into place. 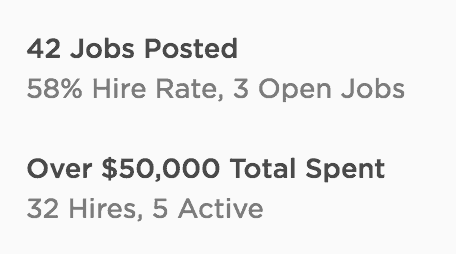 1) How impactful is having a profile video on Upwork? Do you know anyone personally who can help people create stellar videos? 2) Did you notice big changes on Upwork once you acquired rising talent and top-rated badges? 3) What are your thoughts on agencies vs individual freelancers on Upwork? Are their benefits of joining forces with 2-4 other highly related freelancers to form an Upwork agency? 4) Do you know of any 3rd party platforms that can help you A/B test your proposals? 5) When you write proposals, how long does it take you on average to put together a high quality proposal for a typical job? Honestly, this is something I haven’t even experimented with, mostly because I haven’t needed to. That said, it is on my to-do list and I can only imagine it would help improve conversions. One thing to note about this, though, is that the video link is not very prominent on your profile, and you may actually be better off directly linking to your video from within your cover letter. This would be made even more powerful if it was a custom video, specifically made for that client. I acquired my Rising Talent status very early on, after only 1 job (If I remember correctly). And soon after, I had the Top Rated status which means I didn’t have much to compare in terms of badge vs no badge. I did see a slight improvement when going from Rising Talent to Top Rated, but that could have been attributed to me getting better at understanding the platform, writing cover letters, etc. Having these statuses will give you some added credibility, but what you say and how you present yourself is significantly more important. I’ve never worked as part of agency on Upwork, but I do often exclude them during my own hiring process whenever I post a job —simply because I prefer to work with an individual. Again, this is something I need to explore a little more, but my instinct says you’re better off working solo. It’s actually impossible to properly A/B test your proposals since they will almost always be different, depending on the job. And, of course, you can’t send 2 variations of a proposal to the same client. This is more of an iterative process that you just get a sense for over time. I have come up with a formula that I find works really well, and it’s something I share with email subscribers, but there’s still an element of “figuring it out” that, unfortunately, can’t be avoided. When I first started out, I’d spend anywhere from 30-45 minutes per cover letter, and I’d make them SUPER personalised. Nowadays, I spend closer to 10 minutes per cover letter (you get faster over time) and I no longer personalise all of it — there’s really no need. Seriously man, I can’t believe you took the time to put so much value on this article. It has really been eye-opening. It’s so true about having your rate and experience level to correlate. I was applying to many jobs without having this in mind, and as soon as I did the interviews started coming. This is surely because I was getting more into the “best match” status inside the clients’ proposals. Again, AWESOME blog, I really wish to read more from you, congrats and keep going! Thanks Luis, means a lot! Can you say that these potential ranking factors are the same for agency or not? Great article Lewis. Thanks a ton!